Many telcos don’t understand the cost of their services and the drivers of their profitability well enough. In many cases, prices for telecom services are set too low by the marketing team, with dismal consequences. Whether you are an FTTx or a Mobile service provider, Investaura experts can help you. In the telecom service provider business, more than in any other business, most costs are fixed in the short-term. However, in the long term, all costs are variable! Even if most costs are fixed in the short-term, this does not mean that the marginal costs of services are zero. For example, commissions have to be paid to the sales channels (e.g. dealers). Also, off-nets call lead to interconnection charges. In any case, however low they might be, all telecom services have a marginal cost that is greater than zero. As a minimum, service prices should be higher than their marginal costs. If not, then there is no way that these services will ever be profitable and the service provider is not only losing money but destroying value. In principle, there is nothing wrong when certain services subsidise other services, as long as the majority of customers are individually profitable (the ideal case) or if not, at least the overall business is profitable. The issue becomes acute when 80% of services are priced below marginal costs. Then the remaining 20% of services have to generate extraordinary high profits to compensate – which is very difficult. Why is service costing useful? Wholesale price setting: calculating the cost of interconnection e.g. termination of voice calls on mobile networks, usually for regulatory reasons. A commonly used methodology is called ‘LRIC’, which stands for ‘Long-Run Incremental Costs’. ‘Long-Run’ is about including all costs as far as possible (but excluding common costs such as inefficiencies, joint costs for which there is no ‘reasonably’ attributable method, and overhead also born by the competition). In a new product launch context, estimate ‘ex-ante’ how end-user prices should be set now and in the future in order to make the business case positive over a 3, 5 or 7 year period. The approach here is to set up a product business plan and reverse engineer prices to reach a certain level of profit over time. whether prices can be modified; more often than not, some services are simply priced too low and are a drain on the telco overall profitability. the average cost with mark-up to account for the cost of capital WACC. When service prices are above their average costs with mark-up, operators are in the value creation zone and exceed their shareholders’ expectations. When services prices are lower than the average costs with mark-up but remain above the average costs, operators are in the profit zone – but they are not meeting their shareholders’ expectation in terms of value creation. 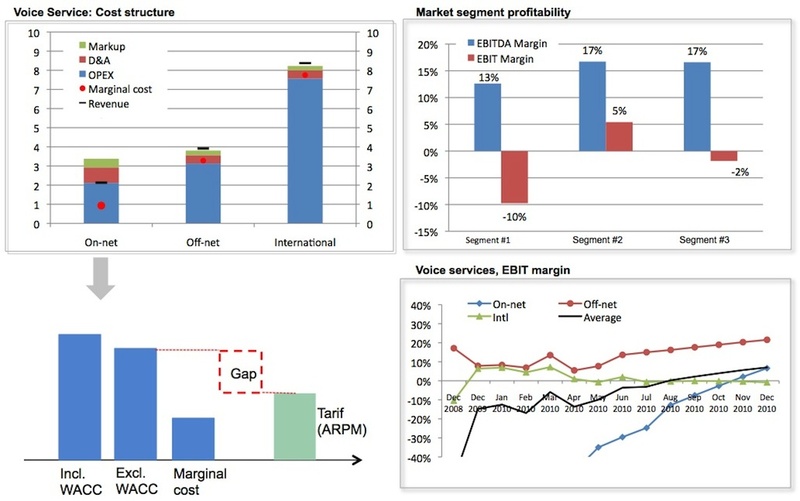 When prices are below average costs, operators are in the danger zone: services are unprofitable today – but might become profitable in the future as the business grows in size, if there are sufficient economies of scale to tap into. Finally, when a service provider is pricing its services lower than its marginal costs, then it is in the death zone. your long-term target must be that prices cover average costs including a mark-up for the cost of capital. In this case you will meet your shareholders’ expectations. If you are not familiar enough with LRIC, FAC and cost allocation principles and would like to have a discussion with one of our experts, feel free to contact us.